You'll experience all the family fun you could ever imagine in this 2019 Forest River Wolf Pack 24PACK14+! Lakeshore RV Center wants to ensure that our customers enjoy their RV adventures and there's no better way than in a 2019 Travel Trailer Toy Hauler from Forest River! From first look to final purchase, we want to ensure your ultimate satisfaction. That includes great service after the sale, too! Here at Lakeshore RV Center, we guarantee you the lowest prices and the best deals! So stop into Michigan's #1 RV dealer and drive out with your dream Wolf Pack today! Whether you live in Michigan or are just visiting, come on in! We're located at 4500 E Apple Ave Muskegon Michigan 49442 and we'll gladly help make your RV dream come true! This terrific 2019 Forest River Wolf Pack 24PACK14+ is 31' 0" long and 8' 0" wide. It has a GVWR of 9985 lbs. and comes with slides that open up to create a roomy, comfortable interior. The hitch weight is 1015 lbs. You'll enjoy outdoor fun under the 14' 0" patio awning. 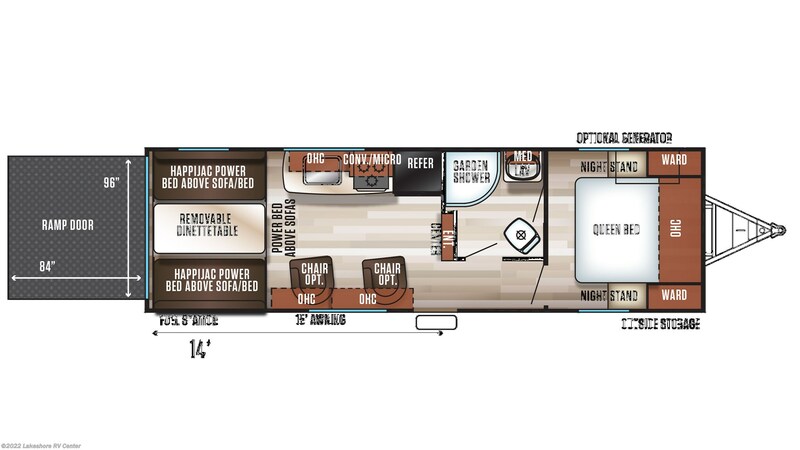 Your family won't feel packed like sardines when camping in this RV, as it's 31' 0" long, 8' 0" wide, and 12' 5" high! If you're feeling chilly on cold nights, turn up the 35000 BTU furnace for some much-needed warmth. Vice-versa, cool down on hot days with the efficient 13500 BTU a/c unit! With a Queen bed as comfortable as the one in this RV, you'll never want to get up and leave the master bedroom! This isn't the only comfortable sleeping accommodation though. There are enough to sleep up to 6 people! Having appliances to cook meals and a sink to wash up is a necessity. Fill up this 2019 Wolf Pack 24PACK14+ and have a good deal of water to go around with your 100 gallon freshwater tank. There will be plenty for scrubbing dishes, getting a refreshing drink, and much more! Stock up your 8.00 cu. ft. refrigerator and set out on a fun RVing trip with all the foods you love! Cook up your meals using the 3 burner range cooktop to avoid the hassle of campfire cooking! You can't always control when you need to go, so wouldn't you want your own private bathroom from the convenience of your camper? You can avoid long trips to the communal restroom with this RV's full bathroom, which features a Foot Flush toilet and a spacious shower. There are no worries of running out of hot water with 40 lbs. of LP tank capacity! The used water and waste are stored discreetly in the 38 gallon gray water tank and the 38 gallon black water tank, so you don't have to see or smell it while you're having fun camping! Check out Stock # 27889 - 2019 Forest River Wolf Pack 24PACK14+ on forestriverrvsource.com!